Inevitably, community theatres are destined to have Shakespeare and zombies. This comedy has both! Dr. Marlowe-Thomas, an aspiring new director, is desperate to stage the ultimate Shakespearean production of the "Scottish Play." She is convinced Shakespeare originally wrote his plays to be performed by a cast of actors that included zombies. To that end, she is auditioning Ian, a struggling young actor, using an original manuscript of “Macbeth.” Before they realize it, two actual zombie actors (Rick Burbage and Eddie Booth, both based on historically renowned Shakespearean actors of their day) appear and the fun kicks in to high gear, mixing theatre superstitions and history, Shakespearean speeches and insults, sword fights, and body parts into a silly, smart, delightful show that is enormously entertaining and slyly educational. Approximate running time: about an hour. We gained a slot in the Minnesota Fringe Festival which meant we needed to write a play to produce. 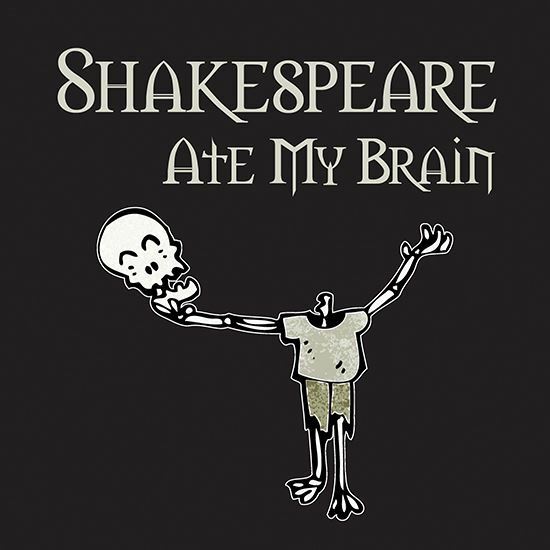 While brainstorming, the idea came up about zombies and then how fun it might be if the zombies were to perform Shakespeare. A perfect fringe show that just took on an afterlife of its own. Each new detail from the theater superstitions to the real historical Shakespearean actors to the pop culture references made the idea something that just had to be written and shared with others. We both like: "I can smell what you're thinking.... delicious!" Why? It's ominous, it's disturbing and really quite silly all at once. Dr. M-T and Ian are both conglomerations of so many theater people we have worked with and loved over the years (and probably they are a little bit us too). Eddie and Rick were real renowned actors of their times and just screamed to be brought back to life after death as zombies. Make people laugh and present Shakespeare's work in a slightly different yet entertaining light.